To report a case of a peripheral exudative haemorrhagic retinopathy (PEHR) associated with treatment response to Aflibercept (Eylea®) and not Ranibizumab (Lucentis®). The authors report 79-year-old women with PEHR who had persistent treatment resistance to Ranibizumab, with rapid improvements once switched to Aflibercept. 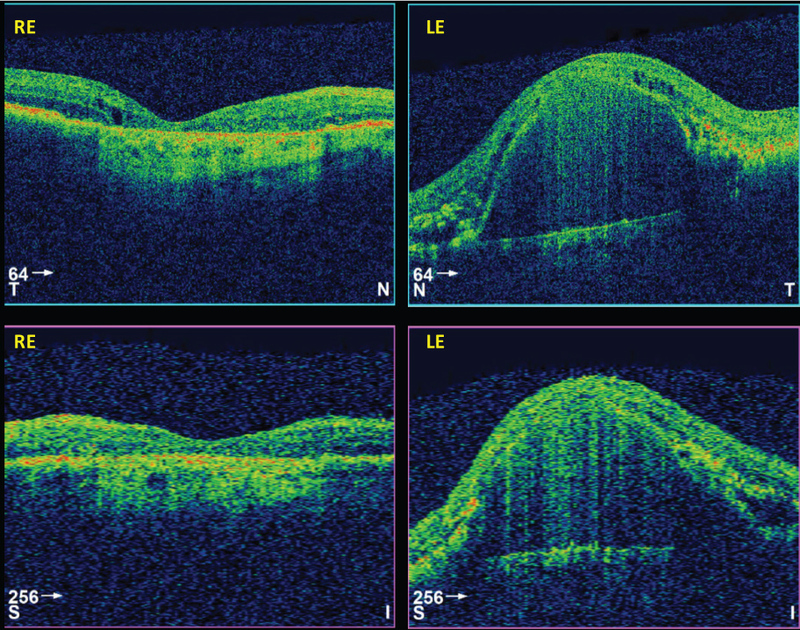 Baseline visual acuity, subjective vision and measurements of anatomical disease were taken using macular optical coherence tomography, wide-field colour, fluorescein and indocyanine-green angiography images. Post-intravitreal injection response was measured using visual acuity, subjective vision and anatomical macular optical coherence tomography findings. Improvements in visual acuity, subjective vision and anatomical resolution of intra-retinal fluid, cysts and retinal thickness were observed by the first Aflibercept injection. Disease remission was maintained with treat-and-extend regimen over a 27-month treatment period. 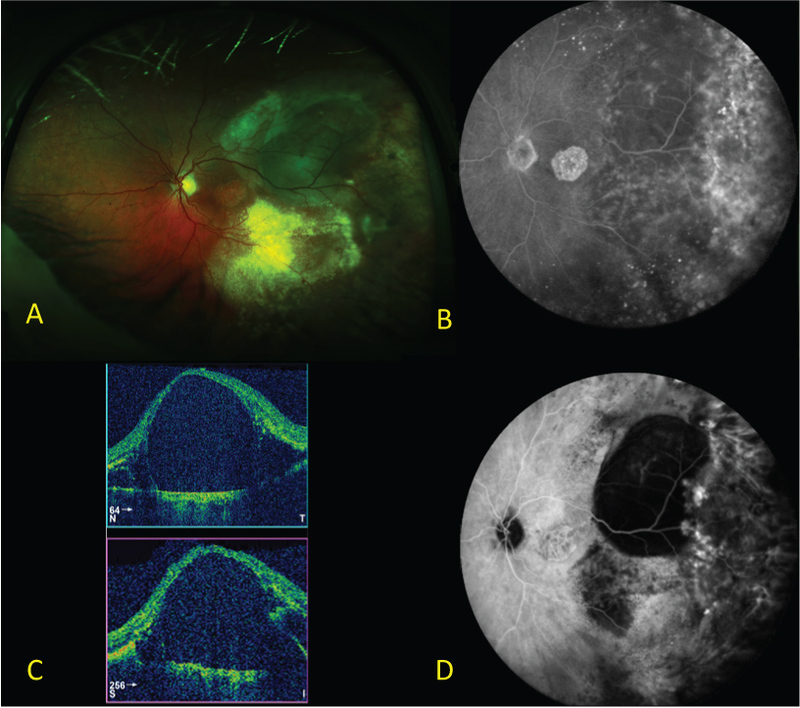 This case report highlights the utility of Aflibercept and a treat-and-extend regimen in the management of PEHR, refractive to Ranibizumab. Further larger studies are required to provide evidence to the efficacy and treatment regimens of anti-VEGFs, including Aflibercept, in PEHR. Peripheral exudative haemorrhagic retinopathy (PEHR) is a rare degenerative disease of the peripheral retina characterised by sub-retinal and sub-pigment epithelial haemorrhage and exudation out-width the macula. Clinically, their appearance commonly mimics choroidal and uveal melanoma and are a can common differential for a pseudo-melanomatous mass. Although differentiated from wet age-related macular degeneration (AMD) due to its central localisation, little established evidence exists for the treatment of PEHR. This unique case demonstrates the novel use of Aflibercept in the treatment and maintenance of PEHR and its prognosis over a 27-month period. A 79-year-old female patient was diagnosed with both eye (BE) PEHR in May 2015. At the time, visual acuity was 48 ETDRS letters in the right eye (RE) and 31 ETDRS letters in the left (LE) due to co-existing centre-involving geographic atrophy. 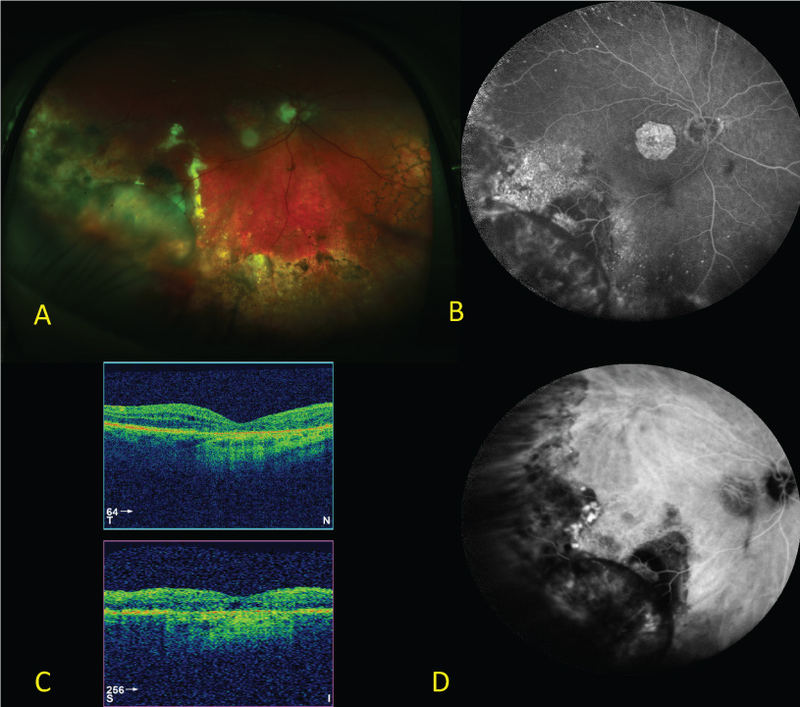 Posterior segment examination revealed bilateral extensive peripheral sub-retinal haemorrhages and exudation with macular involvement manifesting with intra-retinal fluid (BE), macular haemorrhages (BE) and pigment epithelial detachment (LE) (Figure 1 and Figure 2). Fundus fluorescein angiography was non-informative due to masking from extensive haemorrhages with indocyanine green angiography demonstrating numerous polypoidal lesions in the periphery of both fundi (Figure 1 and Figure 2). B-scan ultrasound served to exclude any other pathology and revealed hyper-echogenic chorioretinal thickening in the periphery of both fundi. An attempt was made to treat peripheral polypoidal lesions visible on ICGA with full-fluence photodynamic therapy (PDT) and the patient was commenced on a Ranibizumab 0.5 mg in 0.05 ml intravitreal injection (Lucentis®, Gen tech Inc., South San Francisco, CA, USA and Novartis AG, Basel Switzerland). Four weeks on, a review post first dose of Ranibizumab demonstrated no changes in visual acuity, or posterior segment findings (Figure 3). At this point, the anti-VEGF was altered to Aflibercept 2 mg in 0.05 ml intravitreal injection (Eylea®, Regeneron, Tarrytown, New York, USA and Bayer HealthCare, Berlin, Germany) every four weeks for 8 months. After the first Aflibercept injection, disease resolution was observed; with improvements in visual acuity 52 ETDRS letters (RE), 38 ETDRS letters (LE) and anatomical macular findings such as resolution of intra-retinal fluid and macular haemorrhages observed (Figure 4). In addition, improvements in patient subjective vision were recorded such as resolving 'dark patches'. After the fourth Aflibercept injection, BE macular haemorrhage and peripheral serous detachments were not present. Peripheral exudation also progressively improved. Eight months on, the overall mode of management was changed from monthly to treat-and-extend, with extensions occurring by one week per visit, to 12 week lies as per August 2017. 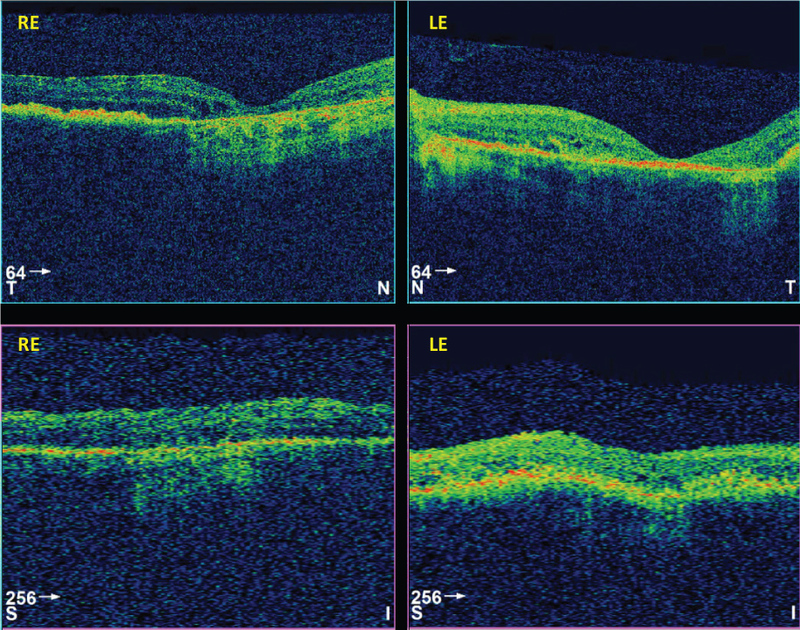 This has been guided by stable optical coherence tomography images, visual acuity and no patient reported symptoms. In total the patient has had 17 Aflibercept injections with the latest visual acuity 50 ETDRS letters (RE), 31 ETDRS letters (LE). On review of the literature, there is currently no evidence-base standard for the management of PEHR with current therapeutic options including observation, photodynamic therapy, cryotherapy, vitrectomy and photocoagulation . No evidence exists for the use of Aflibercept, however multiple case reports exist for the use of an alternate anti-VEGF, Bevacizumab [2-5]. Although these case reports demonstrate favourable short-term outcomes, their efficacy long-term remains unclear [2-5]. In a retrospective case series of nine patients, Seibel, et al. reported no statistical differences between the use of Bevacizumab or Ranibizumab (average of 3 consecutive injections; range 1-5) in functional or anatomical outcomes when used pro re nata. Interestingly, they did report re-treatment was required for two out of nine patients after median 14-month interval (range 12-16 months) which has similarly been reported elsewhere with the use of Bevacizumab . The pathophysiological mechanism behind our experience of both Aflibercept and Ranibizumab is poorly understood however might be explained by the higher binding affinity and longer acting duration of Aflibercept when compared to Ranibizumab . In addition, pharmacological differences in the chemical derivation of either anti-VEGF's binding sites exist. Whilst both are recombinant fusion proteins that are bound to human immunoglobulin IgG1, Aflibercept (C4318H6788N1164O1304S32) utilises human-derived VEGF binding portions from receptors 1 and 2 whilst Ranibizumab (C2158H3282N562O681S12) utilises a mouse-derived monoclonal VEGF antibody . It remains unclear if these differences would contribute to our experiences or those reported elsewhere . To our knowledge this is the first case that describes the use of Aflibercept in the treatment of peripheral exudative haemorrhagic retinopathy after starting Ranibizumab. Our report provides novel insight into the use Aflibercept using a treat-and-extend management regimen in the management of PEHR, similar to that used in wet AMD. This may allow for both better PEHR disease control and preserved vision where other case reports have found this elusive and contributes further literature to an understudied disease. KB provided case identification and access to data, ZA collected the data and wrote the manuscript. All authors reviewed the final manuscript. None of the authors have any financial or conflicting interests to disclose. Collaer N, James C (2007) Peripheral exudative and hemorrhagic chorio-retinopathy...the peripheral form of age-related macular degeneration. Report on 2 cases. Bull Soc Belge Ophthalmology 2007: 23-26. Alforja MS, Sabater N, Giralt J, Adan A, Pelegrin L, et al. (2011) Intravitreal bevacizumab injection for peripheral exudative hemorrhagic chorioretinopathy. Jpn J Ophthalmol 55: 425-427. Pinarci EY, Kilic I, Bayar SA, Sizmaz S, Akkoyun I, et al. (2013) Clinical characteristics of peripheral exudative hemorrhagic chorioretinopathy and its response to bevacizumab therapy. Eye (London, England) 27: 111-112. Seibel I, Hager A, Duncker T, Riechardt AI, Nurnberg D, et al. (2016) Anti-VEGF therapy in symptomatic peripheral exudative hemorrhagic chorioretinopathy (PEHCR) involving the macula. Graefes Arch Clin Exp Ophthalmol 254: 653-659. Takkar B, Roy S, Sodhi PK, Azad S, Bajwa GS (2017) Peripheral choroidal neovascular membrane in a case of peripheral exudative hemorrhagic chorioretinopathy managed with combination therapy. Int Ophthalmol 37: 429-431. Thomas M, Mousa SS, Mousa SA (2013) Comparative effectiveness of aflibercept for the treatment of patients with neovascular age-related macular degeneration. 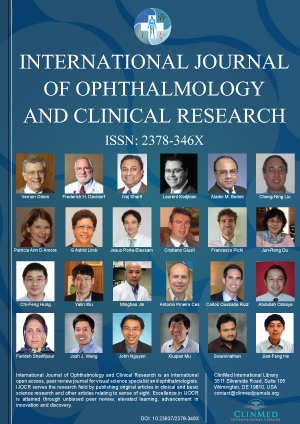 Clin Ophthalmol (Auckland, NZ) 7: 495-501. Dr. Zeyad Al-Moasseb1, MRes MBChB. Academic Foundation Doctor, UK. © 2018 Al-Moasseb Z, et al. This is an open-access article distributed under the terms of the Creative Commons Attribution License, which permits unrestricted use, distribution, and reproduction in any medium, provided the original author and source are credited.